nice! what camera was that? Thank you for the comment. This picture was done with a Nikon Digital Camera model E995. I love the camera except the fact it takes an expensive bettery back. Wow, what an incredible photo! 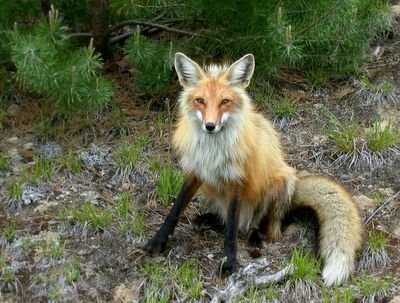 I have rarely run into foxes in my neck of the woods, and when I do see them they run away as fast as they can. How in the world did you get her to sit so calmly for you? Hi Judith, thank you... this was a rare treat indeed to have her pose for me. Like you, past encounters were brief moments of a flash of red(ish) fur, if even that fortunate. Very reclusive critters are the red fox, but every once in a great while they will grace us with their pressence. The only other times I've seen a wild fox for longer than a second or two was if they were sick or had been killed in the road :( I do spend a LOT of time out in nature, I guess that gives me more opportunity than some. Isn't she majestic? It's as though she is holding court, waiting to hear what you have to say. Your photos compare, more than favorably, to those found on WebShots, and other sites. You have an excellent eye for color, composition, and (most especially) subjects.